Upper rt prof; l[eft] Lester Clinefelter; 3 down, 3 over 2 l, Otto Bethke # 3; # 2 Margaret Jones (Stone). School days in Old Oswego. 1908 - 9. Hep Shipley. Ruth? Erickson; Lester Jones; Gladys Yates; have negative; for library. Description Scanned as B & W; same as 371b. There is a hand drawn chart, identified by Nell Kyle with students names: front l to rt: "Heppel [Hepple] Shipley, Isa Austin, Henry Gans [jr.], Ruth Erickson, Lester Jones, Gladys Yates [Jones (Emerick)]. 2nd row: Horace [Orce] Jones, Nina Worthington, Eugene Waldorf, Tucie Todd [Churchill], Clifford [Happy] Johnson, Arva [Avera] Todd. 3rd row: Clyde Churchill, Margaret Jones [Stone], Otto Bethke, Mabel Churchill, Ettie Wilson. 4th row: William [Willie] Nagel, Albert Rosentreter, John Conway, ___ [Mary Jarisch (married Charlie Bickner)], Ray Duncan, Anna Duncan [Potter]. 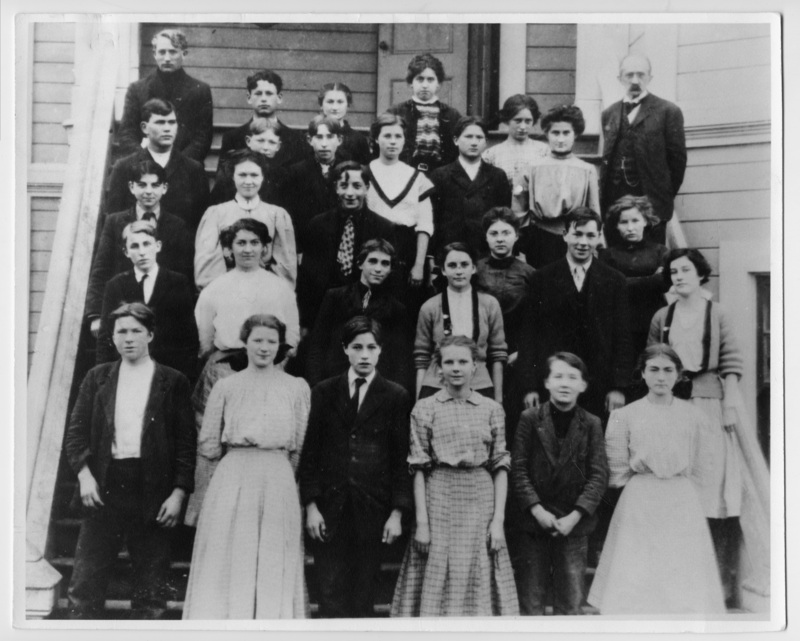 4th row: Lester Clinefelter [(not a pupil, he just liked to visit)], Thomas Elston, Harriet Duncan [Munnick], Dena Prosser, Bertha Elston, Principal Clare G. Morey. About 1907 or 1908. [1908-9, 7th,8th,9th]" There are two other sheets with names with different or additional information; this shown in brackets. Transcription Upper rt prof; l[eft] Lester Clinefelter; 3 down, 3 over 2 l, Otto Bethke # 3; # 2 Margaret Jones (Stone). School days in Old Oswego. 1908 - 9. Hep Shipley. Ruth? Erickson; Lester Jones; Gladys Yates; have negative; for library.